As a proud mom to a golden retriever puppy named Sky and online interior decorator, these pup pillows caught my attention and tugged at my heart. 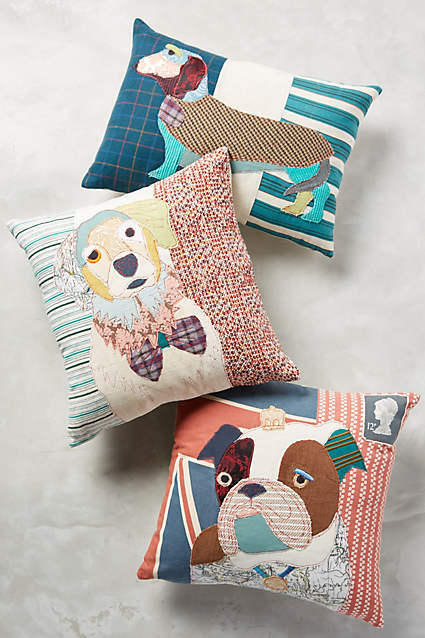 Adorable is the best word I can use to describe these throw pillows from Anthropologie. Artist Carola van Dyke’s passion for color and texture is undeniable. I await the opportunity to design a little boy’s room using these pillows are inspiration. Paired with khaki bedding and smoky blue walls, the Hound pillow would have a forever home in a little guy’s room. For other design inspiration, follow my Pinterest board Because It Makes My Heart Sing.